HTTP/2 is a major update to the Hypertext Transfer Protocol, the underlying communication protocol used to move data back and forth over the web. It’s the first major update to HTTP is nearly 15 years, and is rapidly seeing adoption growth and support in both browsers and web servers. DreamHost VPS and Dedicated servers running Nginx are capable of supporting HTTP/2 out of the box, with no additional user configuration required. DreamPress servers come with Nginx and HTTP/2 by default for SSL/TLS. What benefits does HTTP/2 provide? Will my site be compatible with HTTP/2? Yes! Browsers that support HTTP/2 will automatically use the newer protocol when connecting to an HTTP/2 webserver; browsers that don’t support HTTP/2 will seamlessly use HTTP/1.1, just as they currently do now. Websites won't display any differently over HTTP/2 than over HTTP/1.1, apart from potential performance increases and faster loading times. Is my TLS certificate compatible over HTTP/2? Yes. Your current Sectigo, Let’s Encrypt, or third-party TLS certificate will work out of the box over HTTP/2. Can I use HTTP/2 for non-secured hosting domains? At this time, only secured hosting domains with a TLS certificate support HTTP/2. This is largely due to the current browser implementation landscape; there are no browsers currently supporting HTTP/2 connections over cleartext. Is HTTP/2 available for shared hosting? No. HTTP/2 is currently only supported for domains on DreamPress, as well as VPS and Dedicated machines powered by Nginx. Shared hosting currently does not support an HTTP/2 connection. Is HTTP/2 server push available at DreamHost? Not yet. HTTP/2 server push allows a server to provide content to clients without waiting for a request. This can improve the time to retrieve a resource, particularly when a large number of subsequent resources must also be retrieved (e.g., a web page linking to dozens of JS and CSS files). Since the open source release of Nginx that provides HTTP/2 support does not include support for server push, HTTP/2 server push is not available on DreamHost servers at this time. HTTP/2 is automatically added and configured for DreamPress—no further action is needed. You can enable HTTP/2 support for your domain running on a VPS or Dedicated server powered by Nginx. Add hosting to a site on an Nginx server. Add an SSL certificate to the domain. 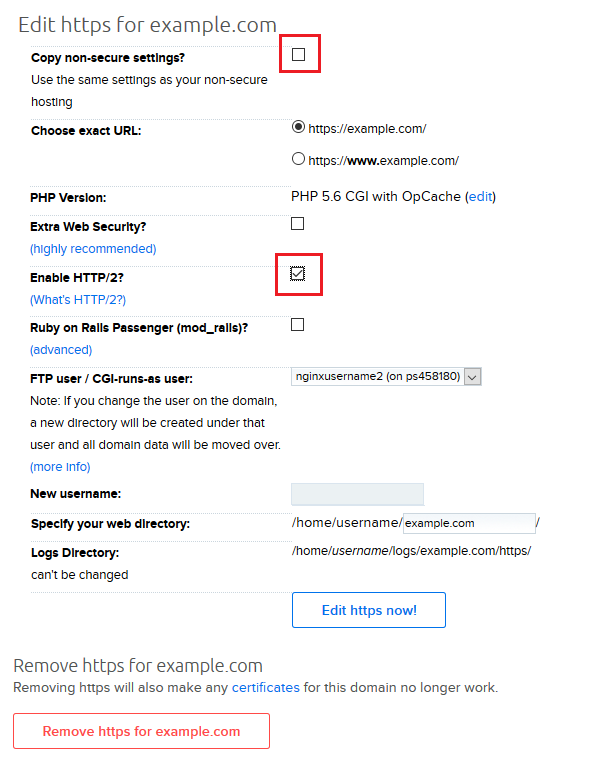 Open the DreamHost web panel and go to Manage Domains. Click the 'https On' link to the right of the domain you wish to edit. On the next page, UN-check the box next to 'Copy non-secure settings?'. Several options appear below. Check the box next to 'Enable HTTP/2?'. When finished, click the blue Edit https now! button.